Recently, I learned that drinking some wheat grass juice a few times a week can be very helpful for certain health problems. Here are the details. HOW MUCH WHEAT GRASS IS NEEDED? One must drink about two ounces daily, or four ounces every second or third day. The best is fresh wheat grass juice. Many health food stores offer this. An alternative is frozen wheat grass juice. However, this is not quite as good. I do not recommend powdered or freeze-dried wheat grass juice. It does not seem to work as well. IS THIS BETTER THAN CARROT JUICE OR GREEN JUICE? Carrot juice. For some people, wheat grass juice is definitely better because carrot juice contains a lot of sugar. Some people cannot tolerate the sugar in carrot juice. Also, the benefits I am referring to in this article only come from wheat grass juice, and not carrot juice. Carrot juice has other nutritional benefits, however. Please be sure to limit carrot juice to 10-12 ounces daily, however. Green juices. Please do not drink green juice. It is much too yin. That is why I do not recommend it. Drinking green juice, or too much of any juice, will make the body too yin, and this is always harmful, no matter what other benefits the juice offers. Others, like Mother Nature Network, point out that there are no medical studies to support Dr. Jensen's findings. According to Dr. Chris Reynolds, who goes by the moniker "Dr. Wheatgrass," the benefits of wheatgrass are primarily biological, not nutritional. CAN ONE MAKE WHEAT GRASS AT HOME? It is a bit of work to make it at home. One must first grow or buy the wheat grass. Some health food stores offer the grass, or it is possible to learn how to grow it yourself. Once you have the wheat grass, only certain juicers will make wheat grass juice. One can buy either a manual or a motorized wheat grass juicer. The manual wheat grass juicer is a bit of work to use. Among the motorized juicers, the Green Star juicer will work. Most other juicers used to make carrot and other juices will not work. CAN I SUBSTITUTE OTHER JUICES INSTEAD OF WHEAT? No. For this purpose, only wheat grass seems to work. However, some of the same benefits occur from eating lots of cooked vegetables, especially cooked greens such as spinach. Eating raw vegetables do not offer the same benefits. It is better to save your stomach capacity for cooked vegetables. Please do not eat either of these. They do not have the same benefits. Also, Rejuvelac is extremely yin because it is a fermented product, so it is best avoided. Wheat grass contains more than 100 elements needed to people, among which are the essential fatty acids, important enzymes and antioxidants. 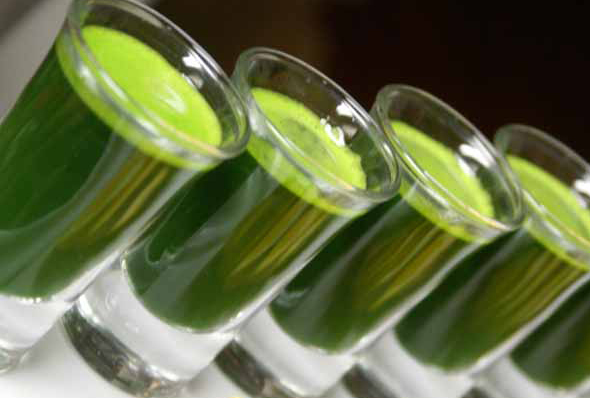 One of the most important elements is the chlorophyll, which is about 70 percent of the composition of wheat grass. Chlorophyll is important to get rid of the toxins and heavy metals from the body. There are also vitamins A, B, B17, C, E, F, K and the minerals potassium, iron, magnesium and calcium. Wheat grass increases the number of red blood cells, cleanses the blood and other organs and stimulates the metabolism. Due to the high content of chlorophyll enriches the blood with oxygen. Effectively cleans the liver and neutralize toxins. It stimulates the thyroid gland and reduces the acidity of the body.